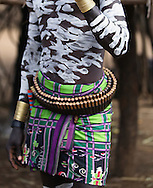 The Karo, which number only about 3,000 people, mainly live on the practice of flood retreat cultivation the banks of the Omo River in southwestern Ethiopia. 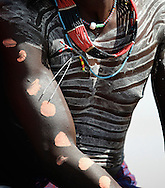 The Karo excel in face and body painting, practiced in preparation of their dances and ceremonies, they decorate their bodies, often imitating the spotted plumage of a guinea fowl. Feather plumes are inserted in their clay hair buns to complete the look. The clay hair bun can take up to three days to construct and is usually re-made every three to six months. Their painted face-masks are spectacular. Karo women scarify their chests to beautify themselves. Scars are cut with a knife and ash is rubbed to produce a raised welt. 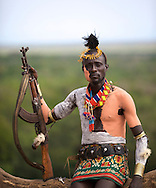 Being the smallest tribe in the area, this group obviously struggles which direct threats from nearby tribes that have more gun power, greater numbers, and likely coalitions with one another.